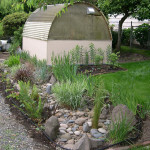 Here are some rain garden locations in and around Multnomah County. 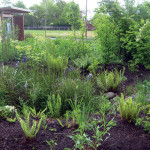 As you can see, rain gardens come in a great variety of shapes, sizes and selection of plants! 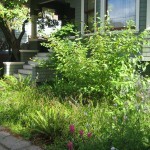 This rain garden is a beautiful addition to the landscaping in the front yard. 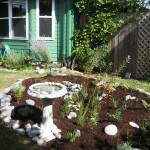 Visit our office at 5211 N Williams Avenue, Portland to see rain gardens in action! 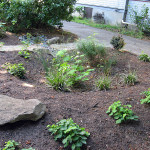 We have six rain gardens, ranging from large to small. A channel through the walking path guides rain runoff from the roof into this newly-planted rain garden. 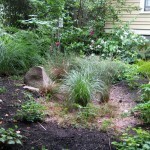 A bird bath adds a bit of whimsy to this rain garden. 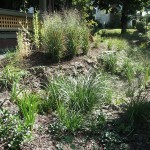 Slough sedge, a sun loving native, make up the majority of the plants in this front yard rain garden. Once the plants have filled in a bit a rain garden starts to look like regular landscaping. 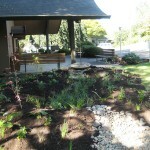 This rain garden manages the runoff from a significant portion of the roof of this church. Many of plants used in this rain garden are native to the Willamette valley (sword ferns, kinnickinick, and Pacific rush). 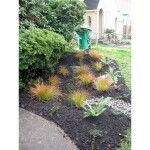 New Zealand sedge adds an extra pop of color. 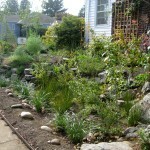 The homeowner incorporated boulders into this rain garden along the home’s side yard. 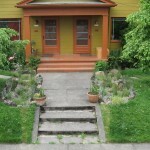 Two rain gardens frame the entryway to this home’s front door.